Andras Kadar | Jordan Ink. 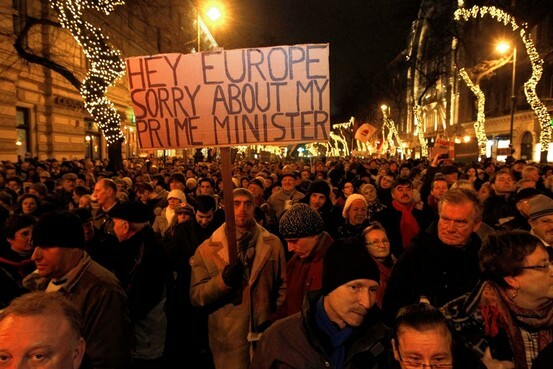 Budapest Winter: Can anyone stop the Putinization of Hungary? BUDAPEST/PRAGUE — With the European Union’s threat of a lawsuit against the Hungarian government for meddling with the independence of its central bank, the world is finally taking notice of Prime Minister Viktor Orban’s aggressive recent moves to consolidate power. But for some Hungarians themselves, the gravity of what’s happening in today’s fractious Hungarian political scene was driven home on Dec. 3 by the blurred-out face of the former Supreme Court chief justice, Zoltan Lomnici. It was one thing for Orban’s muscular center-right government to replace the upper ranks of state television and radio with its own loyalists after winning a two-thirds “supermajority” in the April 2010 parliamentary elections — seizing control of state-run media by incoming governments still remains an acceptable spoil of political warfare in post-Communist Central and Eastern Europe. But it was another when, in a news report, Hungarian state television pixilated the face of Lomnici — a one-time Orban loyalist who had recent fallen afoul of the prime minister — to conceal his identity from viewers. And that was the final straw for Hungarian TV staffers Balazs Nagy-Navarro and Aranka Szavuly. Navarro and Szavuly say the Lomnici pixilation proved that the minions of Orban’s party, Fidesz, have taken media combat one step further: They are willing to manipulate stories, edit tape to suit their agenda, and instruct reporters on whom to interview and whom to ignore. To Szavuly, these tactics epitomize Fidesz’s society-wide conquest. Step by step the party has gobbled up all forms of independence, opposition, and checks-and-balances in one of the EU’s newest members — reminiscent of the “salami tactics” of the late 1940s, when Hungarian Communists gradually hacked away at enemies like slices of salami. Although Hungary was once “the best pupil in the class” of ex-Communist states striving to join Western institutions — a model of economic dynamism and political reform — wayward Budapest has become a political thorn in the side of a European Union already reeling from Euro-induced calamity.